Updated: Jan. 31, 2019, 3:04 p.m.
Nan Rushing, an early member of the Silent Generation, and me, an early member of Gen Z, were in stark generational contrast as we sat in the Statesboro Regional Library. Rushing was born on April 15, 1929, into a world in which you had to have a government-issued coupon to purchase a pair of shoes and farming was done with mules and plows. And almost exactly 72 years later, I was born on April 20, 2001, into a world in which you can buy shoes at any time and farming is done with computer analysis and giant machines. As I sat with someone who refers to World War II as “The War,” I was struck with the feeling of being completely overwhelmed. Before the time that I was a thought in my parents’ minds, Rushing had been the president of the Bulloch County Association of Educators (1976-1977), the Bulloch County Teacher of the Year (1987), the recipient of the Student Voice Award given by the Georgia Council of Teachers of English (1992 AND 1994), and not to mention, in 1985 she received the Instructional Improvement Grant for the Junior High Write-Off. You may know this as the Nan Rushing Write-Off, which is still ongoing today, and in which I was a participant in middle school. She has accomplished more than most can hope and lived a wonderful, long life. She is who I want to be when I grow up. Since Rushing spoke with such love and fervor about teaching and her former students (whose work she still has and of which she proudly speaks), it is easy to focus on this sole aspect of her life, however, when a life spans 90 years, there are copious amounts of lessons and history that should be considered. Rushing proved this as I spoke to her and in her article, “Remembering and Reminiscing,” which recounts some of her great memories from life and how times have greatly changed. As I read this article, it was unbelievable. Rolling stores? Sweeping yards? Wearing clothes made of feed or flour sacks? Washing clothes in galvanized tubs? No electricity? Unheard of. All of it. Sure, we’ve all read about these times in our history textbooks, but it’s just that to us: history. There is a large disconnect, we learn about times in the past, but frequently we do not truly believe it. Yes, people actually did those things, yes people actually lived in the 1920s. Rushing is lively and bright proof of that time period. As her life continues, Rushing has not let her age affect her. She has been a member of Union Baptist Church for the past 67 years, has taken the church’s minutes for 54 years, and continues to be their sole pianist. 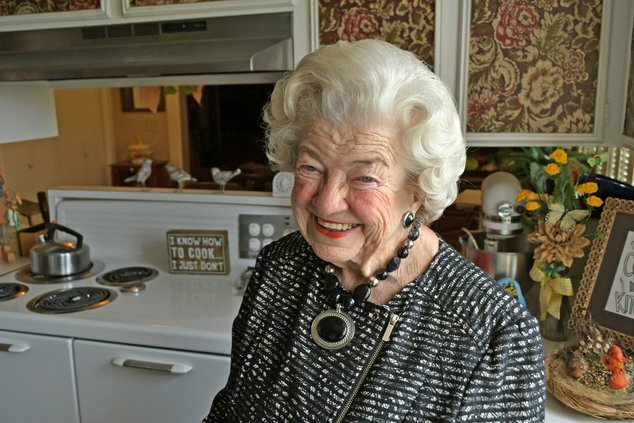 She has written a cookbook, “Two Cooks in the Kitchen,” with her dear friend Buford, and sold almost a thousand copies. Currently, she is working on writing a book which will center on creative writing, and the preface of the book will feature five students’ works about her, which were submitted for Georgia’s Student Voice Award. As our interview came to a close, and as she said those words, a tide of awareness washed over me as I began to appreciate the amount of life that Rushing has and continues to experience. It is not often that you have the chance to speak to someone with such an abundance of history, so if you ever do, I encourage you to listen intently. The words of those before us —Rushing’s conversation and writing — are filled with authenticity and wisdom, their words have many stories to tell, and many lessons to teach.